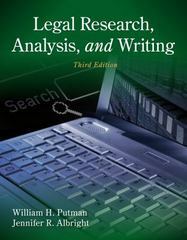 Legal Research, Analysis, and Writing 3 Edition Comprehensive yet easy to understand, the third edition of LEGAL RESEARCH, ANALYSIS, AND WRITING teaches the fundamentals in a hands-on, step-by-step format that is designed to build confidence. With coverage of key topics such as research analytical principles, legal research, legal analysis, and legal writing, this popular book covers the information readers need to know in order to find, access, apply, and analyze legal materials. Numerous hypotheticals, examples, and exercises clarify material and give readers additional opportunities for practice. In addition, the third edition includes the most up-to-date information in the field, with special attention given to electronic research programs such as WestlawNext, LexisNexis interface, Shepard's online, and Westlaw's KeyCite.